This business like many others have found business and customers on the Internet. 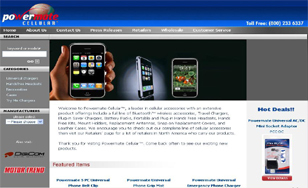 Their main business is the sale of cellular parts and their ecommerce website developement allows them to display the products they sell and lets visitors view them pleasant manner. An ecommerce website design is completely self maintained and allows you to make any changes as your products change or new products are added. A visitor can very easily make online purchases with the use of their credit card. If you have a product to sell and would like to expand your business, an ecommerce website design could be for you.